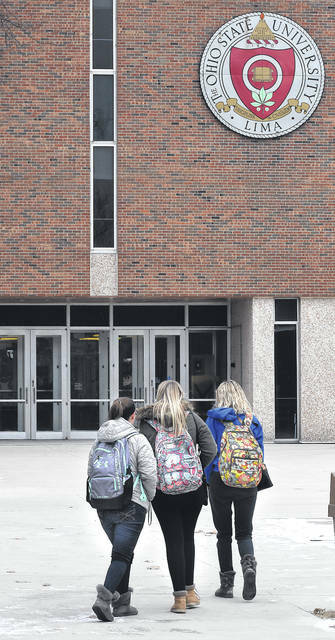 Students walk to classes at the Ohio State University-Lima campus on Thursday. Ohio State is one of 37 college campuses recognized for meeting all five areas of concern where it comes to sexual assault. 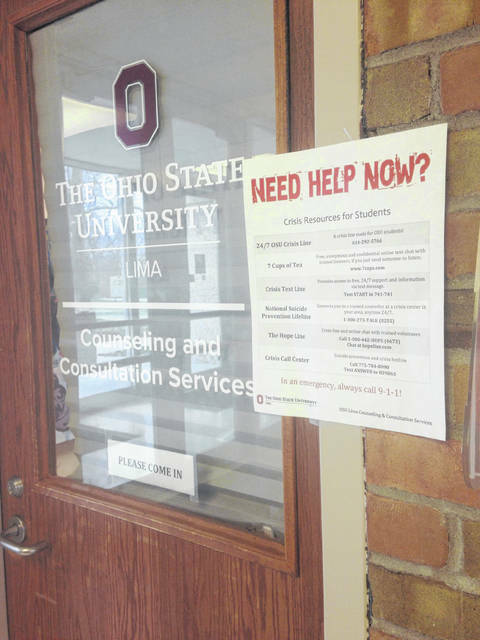 Signs outside the counseling office help direct students to the appropriate resources on the campus of Ohio State-Lima. 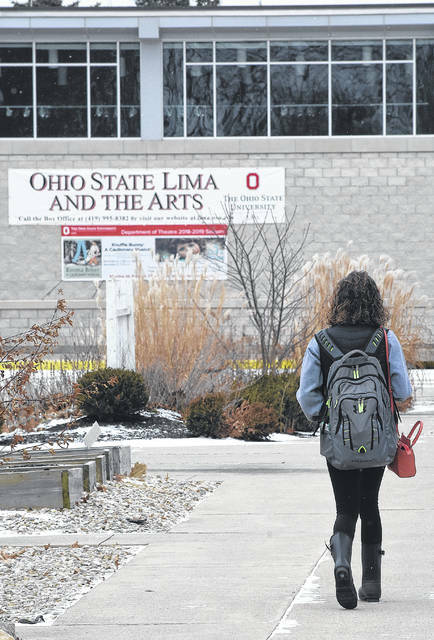 Students walk along a path on the shared campus of Ohio State-Lima and Rhodes State College, both of whom have taken strong stances against campus sexual assaults. A student walks to class through the quad at Ohio State-Lima’s campus Thursday. LIMA — Local college campuses have made significant progress in the areas of sexual violence awareness and prevention over the last few years. In 2015, the Ohio Department of Higher Education introduced a grant aimed at increasing the conversation and programs on all state college and university campuses called Changing Campus Culture: Preventing and Responding to Campus Sexual Violence. The grant details five recommendations of how to achieve this progress. Each year, ODHE recognizes all campuses implementing three or more of these recommendations, each earning them a star. Ohio Northern University and Ohio State are two of the 37 campuses in 2018 to be recognized with all five stars. The University of Northwestern Ohio was recognized for achieving four of the five, and Rhodes State earned three stars. Despite the efforts and progress campuses are making in regards to awareness and prevention, OSU-Lima junior Josh Simmons, of Cleveland, said it still doesn’t change the actions of some students. Alaya Simmons, a freshman from Toledo, said she does feel safe on the OSU-Lima campus, but like anywhere else, she is always consciously aware of her surroundings. The $2 million grant was issued with the goal of ending sexual violence on Ohio campuses through a series. The budget continues to go toward support strategies, data analysis and training. Ohio institutions can also apply for individual grants to aide in their efforts further. ODHE’s website lists the Changing Campus Culture recommendations as using an annual campus climate survey to guide action, empowering all campus staff with evidence-based training, communicating a culture of shared responsibility, developing a comprehensive response protocol and adopting a survivor-centered response. Another key component of the Changing Campus Culture grant is providing workshops for campuses and its partners to attend. Colleges can also partner with local resources to help implement these recommendations, such as Crime Victim Services in Lima. The Ohio State University at Lima, Rhodes State College, the University of Northwestern Ohio and Bluffton University work specifically with Nicole Fairburn, CVS’s campus sexual assault survivor advocate. There was a workshop this past summer that Fairburn attended along with Rhodes State and UNOH that focused on how each college can implement its own prevention plans. Fairburn has worked for CVS since 2016 and said the continued education from the grants certainly helped the Lima colleges in advancing their programs. 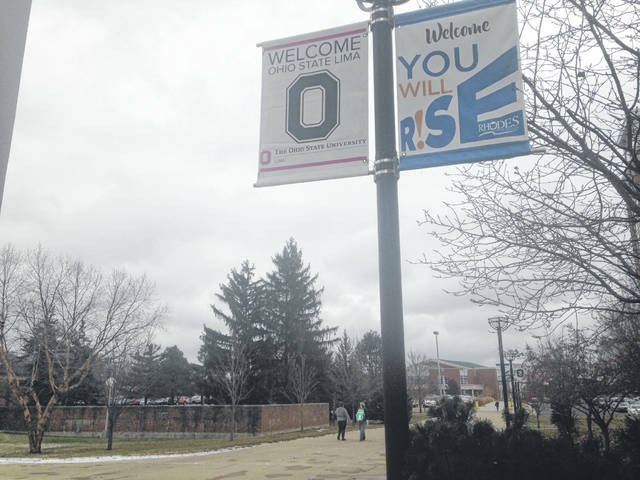 OSU-Lima’s campus funnels most of the programs and investigations through the main campus in Columbus, but Director of Student Life Shane McCrory said that collaboration is more of a resource than a hindrance. Any Title IX investigations are conducted in Columbus, but Title IX officers often travel to Lima if needed. McCrory serves as the Lima branch contact and assists students through the investigation, often connecting them with CVS as a local resource. Not only have awareness programs and the overall conversation about sexual violence on campuses increased, but it has had a direct result on the number of students reaching out and speaking up about their encounters. CVS created the campus advocate position in 2016 with Fairburn, and since then there has been an increase in student reach out each year. “We’ve really been trying to increase our presence on campuses, and we’ve done that. With increased presence comes more people realizing they have an advocate,” Fairburn said. “I don’t think we are able to say there’s more (violence) happening, it’s that there’s more being reported because we have this resource. Most of the victims CVS come across are referred by the friends of those victims. However, the resources at each college or university within the center’s 16-county coverage area can also refer victims so CVS can provide services while the investigation is ongoing. CVS also partners with OSU-Lima, Rhodes State and UNOH to add consent presentations to all orientation/first year seminars. These orientations discuss what sexual assault is and how to report it, as well as identifying healthy sexual behavior. Also incorporated is information on bystander intervention and how to intervene when unhealthy behavior is noticed. McCrory, whose office is just outside of the student lounge areas in the Student Life Building, said he has noticed a shift in conversation on campus as a result of this training. “Since more and more of these students are going through these trainings, they’re feeling more comfortable about intervening and stopping things that are inappropriate,” McCrory said. Bluffton students Zac Nobis, a freshman from Bryan, and Makenzie Speakman, a sophomore from Lancaster, said as campus athletes they receive information every year. “I’m not sure what’s available for regular students, not anything like that as far as I’m aware, but our athletes do make up about 70 to 80 percent of this campus,” Speakman, a volleyball player, said. Nobis, who is on both the Bluffton football and baseball teams, also referenced the two online training modules he had to take as a freshman this year that discusses avoiding certain situations, knowing the signs to help others in danger and also provided resources for those effected. Fairburn said they key to the most successful programs is involving as many groups on campus as possible. Some of these groups may involve campus security or law enforcement, student life offices and counseling centers. However, she said the key is student involvement.